Glass graphics are a great way of improving the look and feel of your home or workplace. And in addition to looking great, they also improve the privacy of your living or work spaces! With a range of glass graphic services available under one roof, we are your one stop shop for graphics and signage. Decorative, frosted or patterned glass graphic design – looks great on meeting room walls, glass kitchen cupboards, entrances and even bathroom windows. And with our in house graphic glass services, you could have your own custom design or logo etched out, for a unique design! 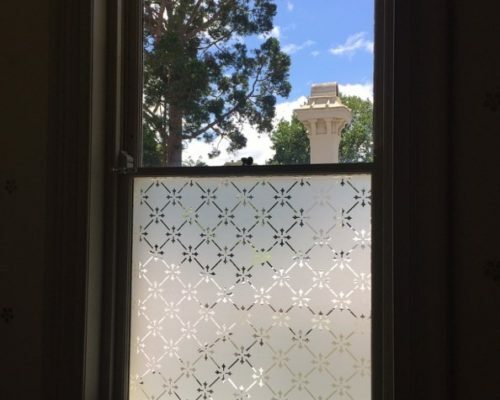 Glass graphics for privacy – installing frosted window film either plain or decorative is a great way of improving the privacy of your living or workspaces. And because they’re installed on your existing glass surfaces, there’s minimum downtime! 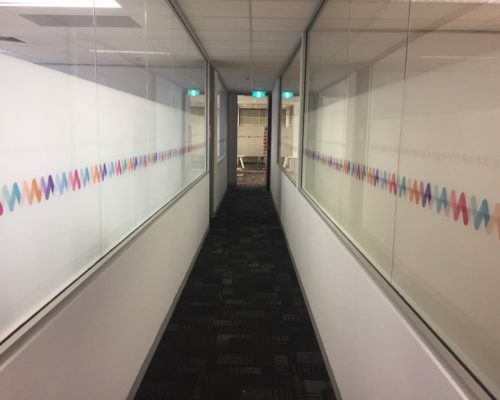 Glass graphics applied in an office workspace for privacy. And applied to home window. Get in touch with our dedicated team to learn more about our range of glass graphic services. We can guide you through all your options, and can even organise and obligation-free measure and quote to get you started!